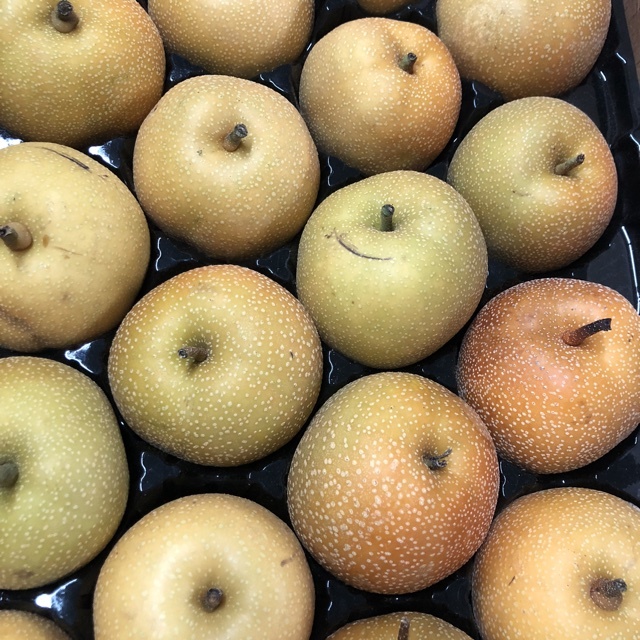 Asian pears range in size from small to medium and vary in shape from round, globular, and squat to oval with a bulbous base that tapers into a rounded top. The firm skin can be golden yellow, green, or bronze and may be smooth, have some russeting, or covered in visible lenticels or pores. The flesh is ivory to white and is crunchy, juicy, and creamy with a central fibrous core encasing several small, brown-black seeds. When ripe, Asian pears are crisp with a sweet, floral flavor, low acidity, and a fragrant aroma. Asian pears are available year-round, with peak season in the early fall through winter. Asian pears, botanically classified as Pyrus pyrifolia, grow on trees that can reach up to seven meters in height and are members of the Rosaceae or rose family. There are thousands of different known varieties of Asian pears, each varying slightly in shape and color, and Asian pears are relatives of the ussuri pear, Pyrus ussuriensis, and the Japanese sand pear, Pyrus serotina. Asian pears are known by many names including Nashi, Japanese pear, Sand pear, Chinese pear, and Apple pear. 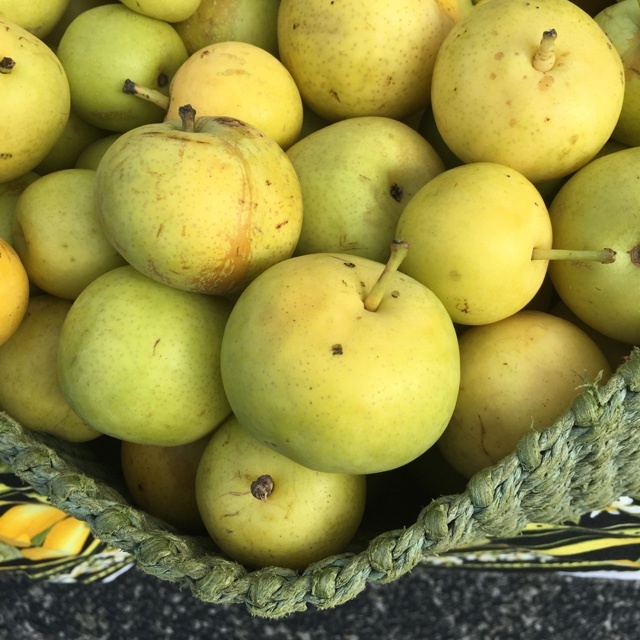 Unlike regular pears, Asian pears ripen on the tree, are only picked and sold when ripe, and maintain their crisp texture long after being picked. 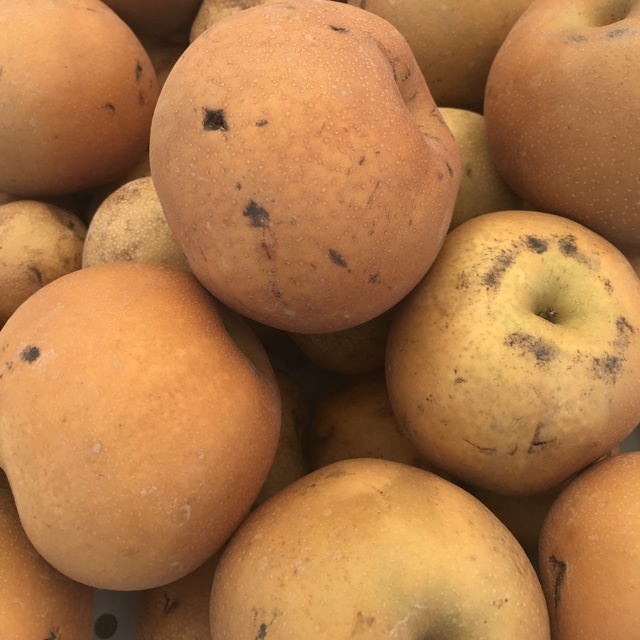 Careful handling must be practiced when picking, packing, and transporting Asian pears as their delicate skin bruises and becomes discolored easily. Asian pears are favored across the world for their crunchy texture and sweet flesh and are predominately consumed as fresh eating fruit. Asian pears are a good source of vitamin C, dietary fiber, and vitamin K.
Asian pears are best suited for raw applications as their crunchy texture, and sweet flavor is showcased when consumed fresh, out-of-hand. They are commonly sliced and added to green salads, cubed for fruit salads, grated into coleslaw, or sliced into stir-fries. Asian pears can also be chopped and added to holiday stuffing, sautéed with cinnamon to serve atop pork chops, slow cooked to make a sweet sauce for short ribs, served in mulled white wine or a warm pear toddy, or hollowed out and stuffed with dried fruit and nuts for a baked treat. Their sweet flavor and juiciness will add moisture and flavor to cakes, pies, crisps, muffins, and quick bread. Try using as a substitute wherever apples are called for. Asian pears compliment cashews, blue cheese, manchego cheese, red onion, scallions, garlic, leafy greens, celery, fennel, sweet potato, salmon, lime, blackberries, honey, sesame oil, shiso, miso, and daikon. 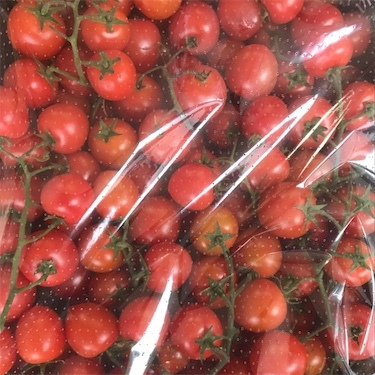 They will keep up to one week when stored at room temperature and up to three months when stored in the refrigerator. In Asia, pears date back to the 6th century and are a symbol of good fortune and immortality in many cultures. In Chinese medicine, Asian pears are considered a cooling fruit and are used for detoxification purposes to reduce symptoms of coughs, laryngitis, ulcers, and constipation. They are also used to help promote a healthy complexion, help lighten under eye circles, and to relieve retina pain. In addition to traditional medicine, during the Edo period in Japan, pears were believed to ward off evil and misfortune, and were often planted near gates and in the corner of properties for protection. Asian pears are native to Japan and China where they have been grown for over 3000 years. The first documented appearance of an Asian pear in the United States was recorded in 1820 when a Chinese sand pear was imported to Flushing, New York. In the mid-1800’s Asian pears made their way to the west coast via Chinese and Japanese immigrants relocating to California after the Gold Rush. Today Asian pears can be found at farmers markets and specialty grocers and are grown not only throughout Asia but in Italy, Spain, Australia, France, Chile, and New Zealand.  In the United States, the bulk of commercial production comes from California and Oregon with a smaller supply coming out of Washington State, Kentucky, and Alabama. Recipes that include Asian Pears. One is easiest, three is harder. 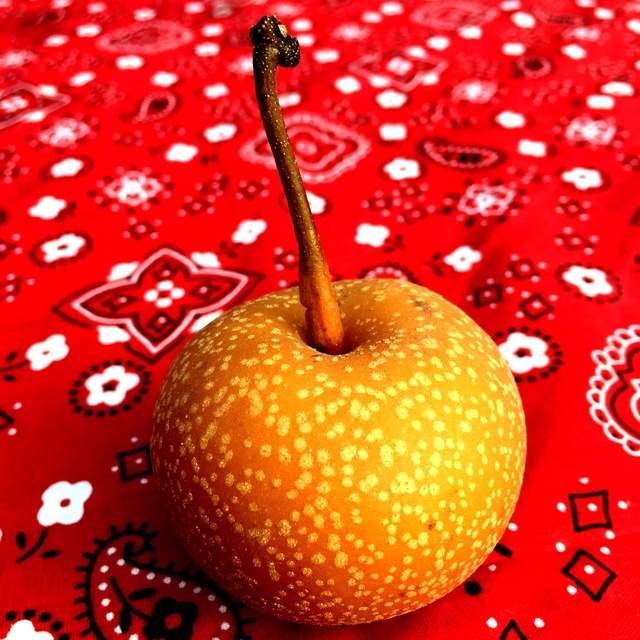 People have shared Asian Pears using the Specialty Produce app for iPhone and Android. 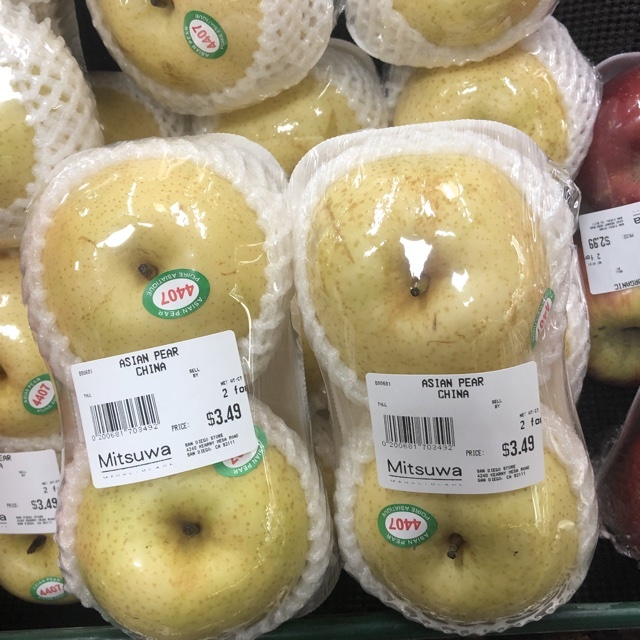 Sharer's comments : Asian Pears spotted at Mitsuwa Marketplace. 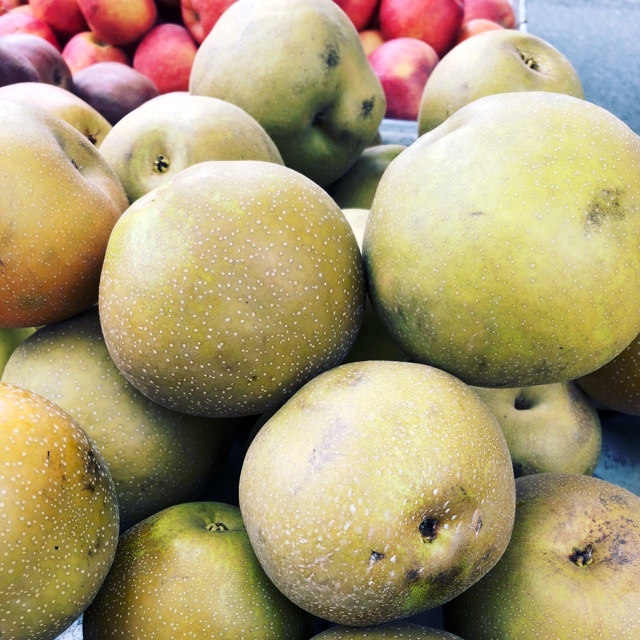 Sharer's comments : Asian Pears spotted at Broadway Sunday Farmer's Market. Crisp, sweet, always a fantastic addition to your salad. Sprinkle with arugula, roasted walnuts - enjoy! Sharer's comments : Asian Pears spotted at Hillcrest Farmers Market. 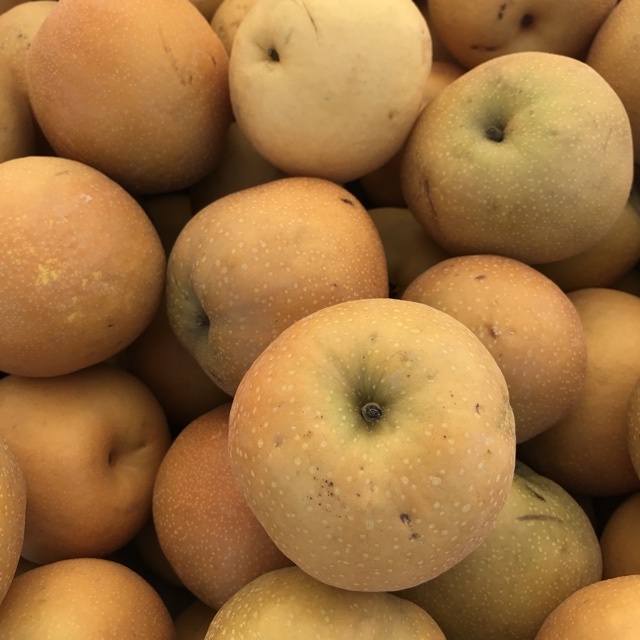 Sharer's comments : Asian Pears spotted at Poway Farmers Market. 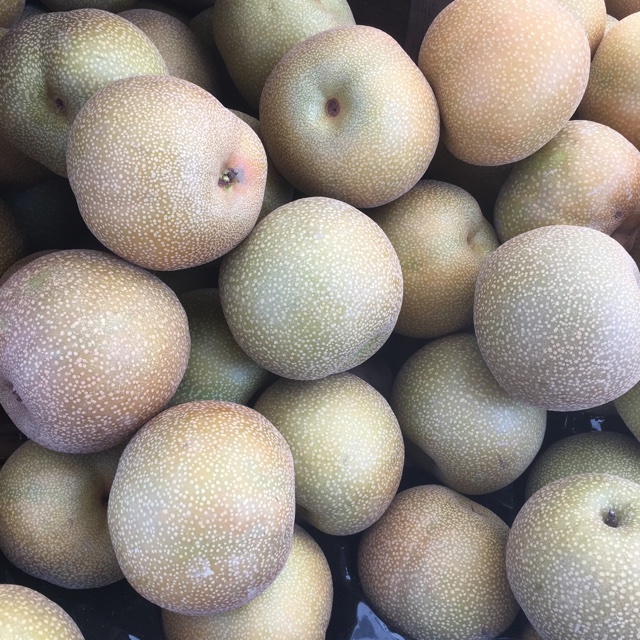 Sharer's comments : Asian Pears spotted at Virginia Park Farmer's Market. Giant and sweet, crunchy and juicy. 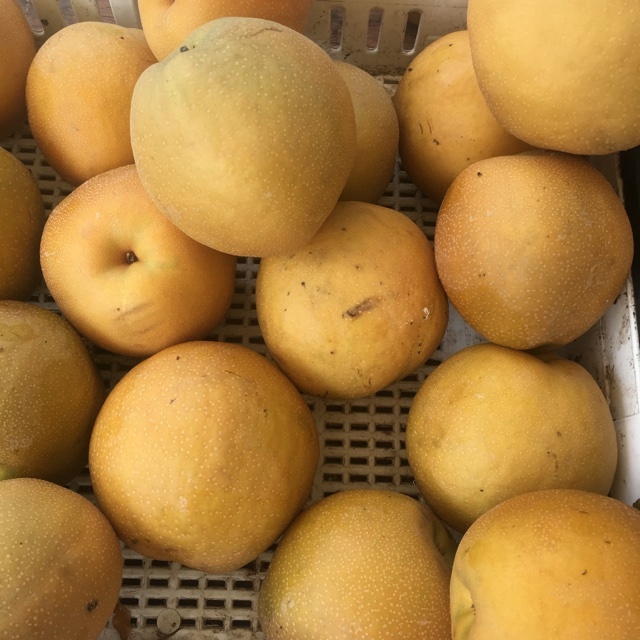 Sharer's comments : Asian Pears spotted at Del Mar Farmers Market. 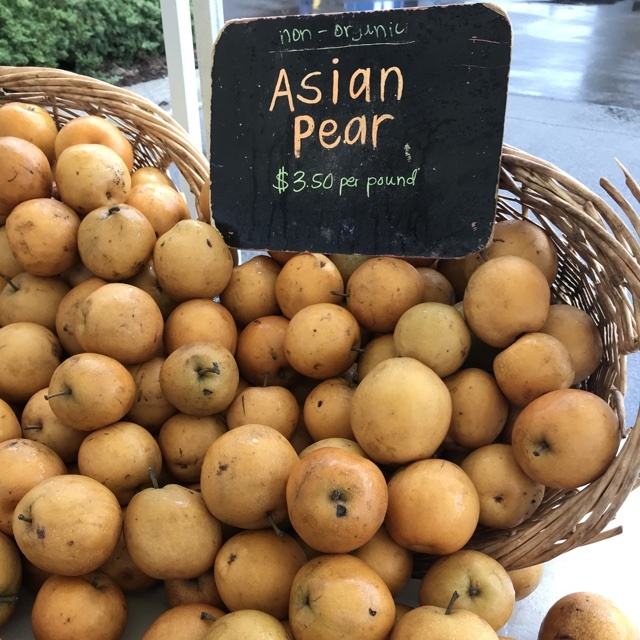 Sharer's comments : Asian Pears spotted at Bothell Farmers Market. A nice healthy treat with a crunch! 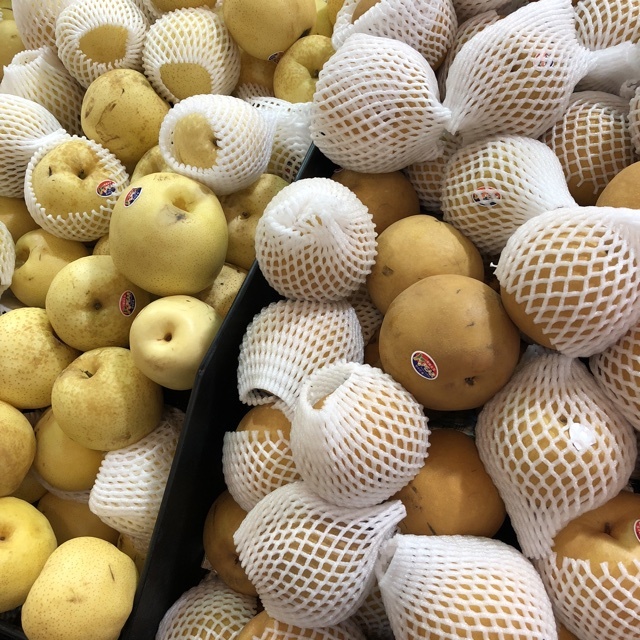 Sharer's comments : Asian Pears spotted at Specialty Produce. First of the season Kosui Asian Pears. This variety is juicy and super sweet with undertonea of vanilla and butterscotch. Grown by Penryn Orchard Specialties. 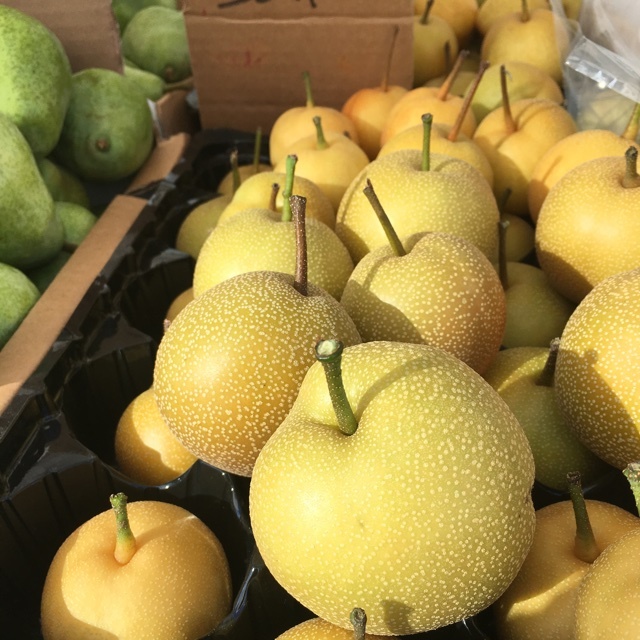 Sharer's comments : Asian Pears spotted at Brentwood Farmers' Market. 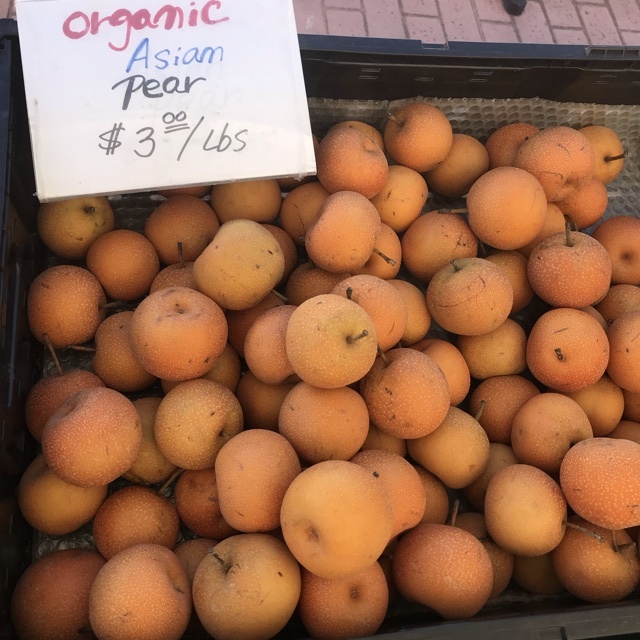 Sharer's comments : Asian Pears spotted at Vista Farmers Market. Sweet and delicious. 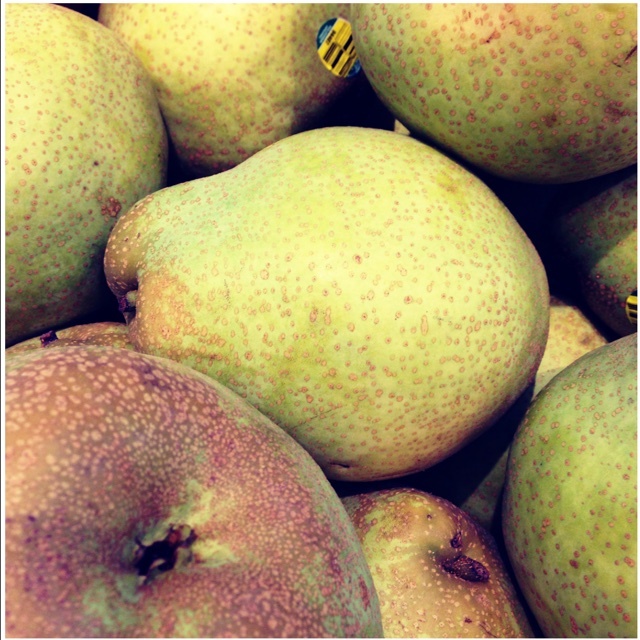 Sharer's comments : Asian Pears spotted at 99 Ranch Market. Golden and Brown/Shinko pears from Korea. Huge and firm! Sharer's comments : Asian Pears spotted at First Alternative Natural Foods Co-Op. Sharer's comments : Asian Pears spotted at PCC Natural Markets. Organic Tsu Li Asian Pear - an asian pear with a pineapple aroma, cream colored flesh, and delicious floral taste! 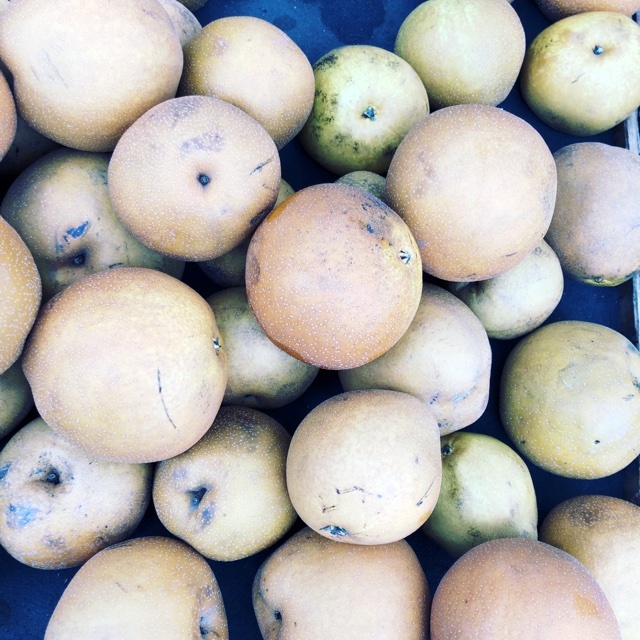 Sharer's comments : Asian Pears spotted at Santa Monica Farmers Market.